One thing that was particularly interesting to me here, was that the emergency telephone line for the service elevator was the same line as the mall's leasing office! In other words, if you pressed the emergency phone button in the elevator, you'd have to hope that the mall's leasing office didn't happen to be using the phone at that moment. Sure, they'd be on the other end of the call already, but would you rather have the leasing office respond to a call, or a service like ThyssenKrupp SoundNet, a professionally staffed 24-7-365 elevator emergency call center. Anyway, this wiring board included a great deal of totally obsolete and irrelevant technology. 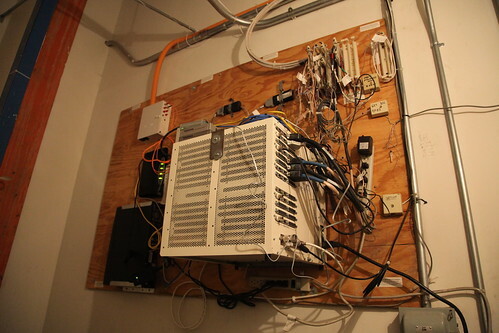 First of note, is the orange tube running in from the ceiling: the Disney store apparently had dedicated fiber, something that was very uncommon (and was greatly overkill) for retail stores in the late 1990s. The large white box was apparently part of the "ShopperTrak' system. The company is still around, and despite the ominous name, its primary service is counting how many people enter and exit a store. ShopperTrak was part of Simon's early 2000s strategy to attract big name retailers by guaranteeing a minimum amount of foot traffic, verified of course by the ShopperTrak system, which used notoriously unreliable passive infrared sensors to generate its numbers. Also on this board: DIY electric service via dollar store power strips. Got a cabinet full of then-delicate and then-expensive communication electronics? Why not use a cheap Chinese-made plastic power strip with no surge protection!